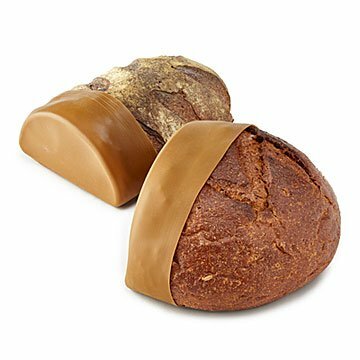 Extend the life of your bread with these silicone caps that keep the inside moist and the crust crisp. Every week, you buy a signature loaf from the best bakery in the neighborhood. Rye and cranberry. Potato rosemary. Carb paradise. But every week, some of it goes stale. End the tragic loss of loaf with these silicone caps that fit over the cut end of your bread and prevent moisture from escaping. The crust stays nice and crisp, the inside nice and soft. That space-hogging bread box you thought you'd have to get? You don't. Just leave your bread on the counter. (But never, ever in the fridge.) Comes in a set of sizes, one for smaller loaves like ciabatta, and a larger one for more robust loaves, like a boule. Made in China. Unfortunately, these do not fit my breads and I am unable to use them. It seemed like a good idea. Nice to keep bread fresh and crust from getting soft.